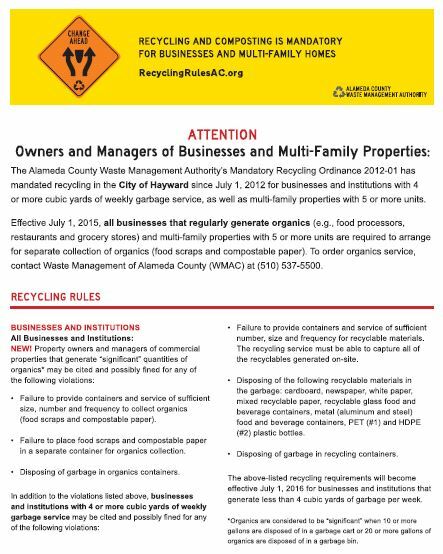 If you are a hauler, disposal facility operator, or city representative in Alameda County, take advantage of these free resources to help you communicate with customers about the Mandatory Recycling Ordinance. 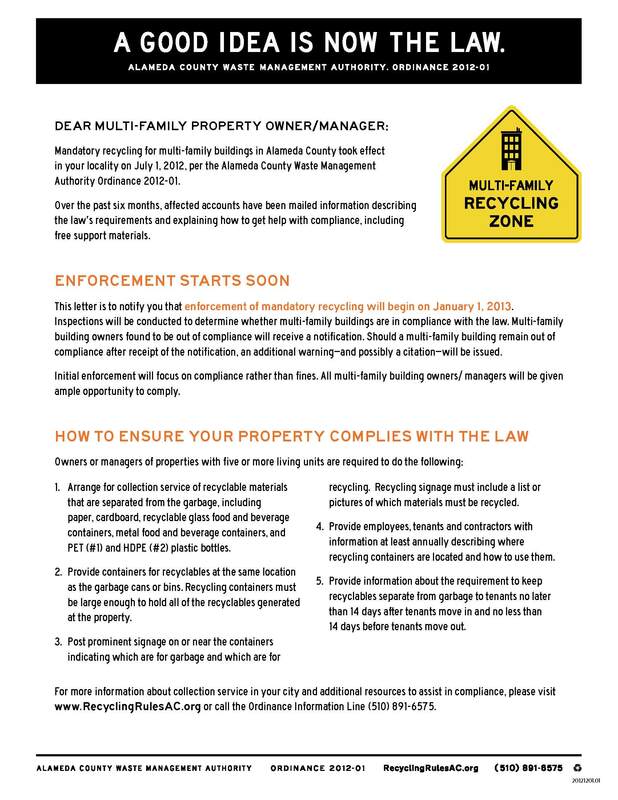 You can also visit the Business or Multi-family Support Materials pages for additional resources to pass along to customers trying to comply with the Ordinance. 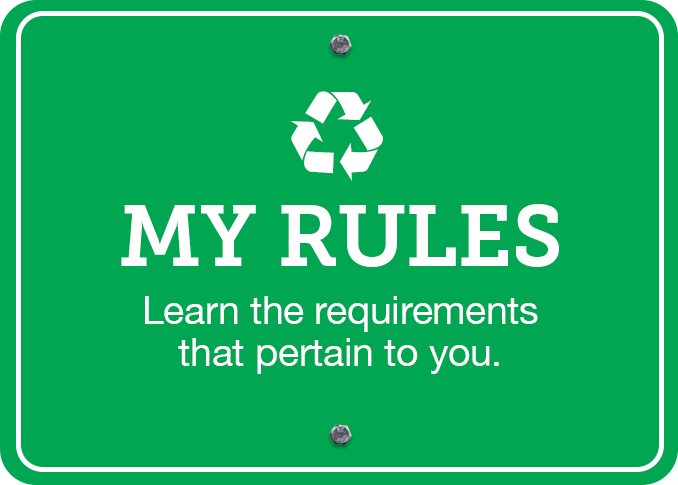 These FAQs will help you respond to your customer’s questions about the Mandatory Recycling Ordinance. 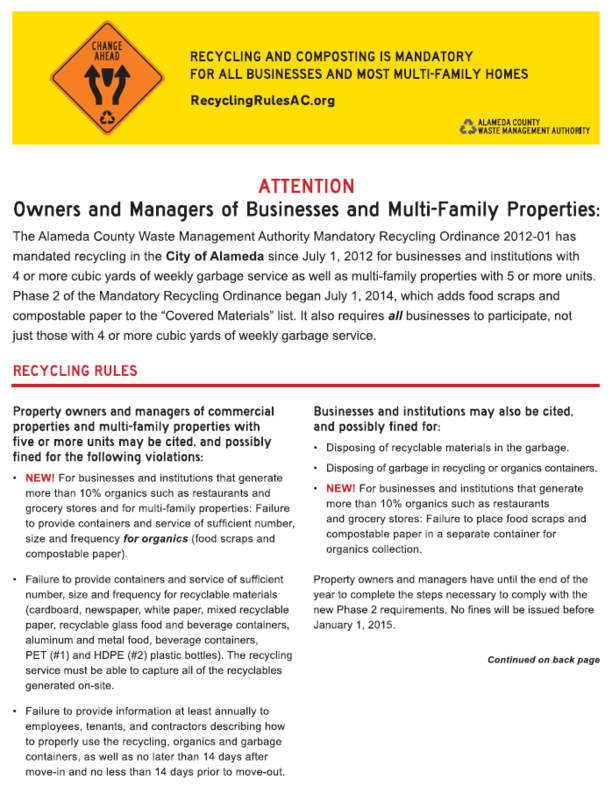 Customers can also be directed to this website (www.RecyclingRulesAC.org) or the Ordinance Help Line at (510) 891-6575. Updated in November 2017 . These 1-page handouts summarize the compliance requirements and highlight resources available to help covered accounts comply with the Ordinance. For more details about the compliance requirements in the various Alameda County jurisdictions, go to Rules by City. Spanish, Chinese, Korean and Vietnamese translations of these overview flyers are posted on the Business and Multi-family Support Materials page. 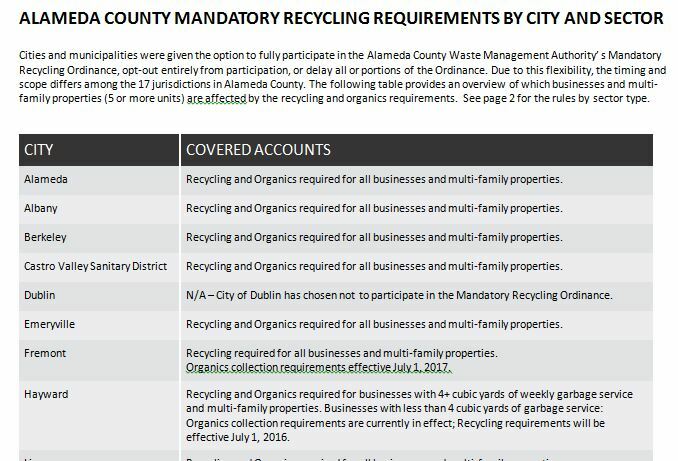 This document contains a table summarizing the covered accounts and requirements for each city in Alameda County and provides information on the recycling rules by sector. These articles provide general information about the ordinance that you can copy into your company’s newsletter. The first two articles reflect Phase 2 requirements that took effect on July 1, 2014, in certain jurisdictions. 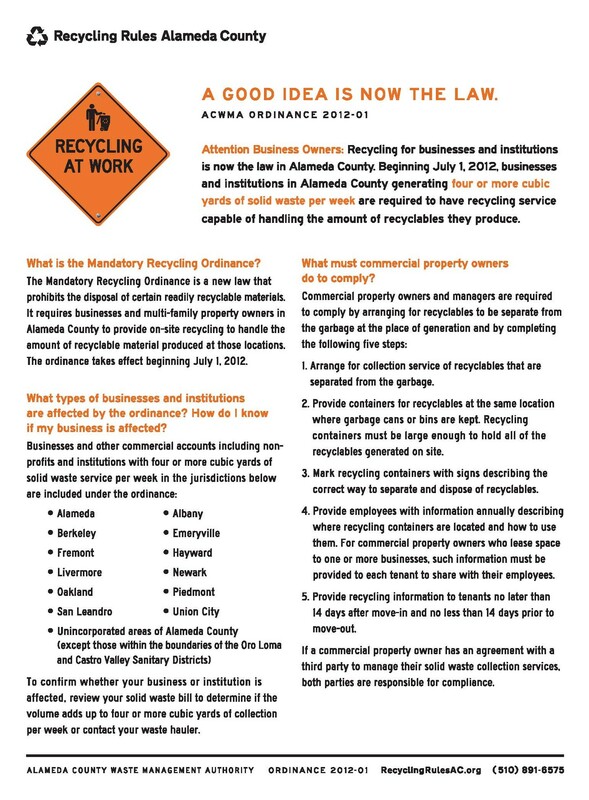 If you’d like assistance in customizing an article to your jurisdiction’s customers, contact BizAssistance@RecyclingRulesAC.org. The two bill inserts have an area on the front face for service provider specific information. NOTE: These bill insert templates do not reflect Phase 2 requirements that took effect on July 1, 2014, in certain jurisdictions. Updated bill insert templates are below. These bill inserts can be used to communicate new Phase 2 organics collection requirements (full opt-in version) or new accounts that have recycling requirements (partial opt-in version). There are also versions of each that have an area on the back for specific city or service provider information. The artwork source files in InDesign are also available upon request. This insert is included with all Official Notification and Notice of Violation enforcement letters. 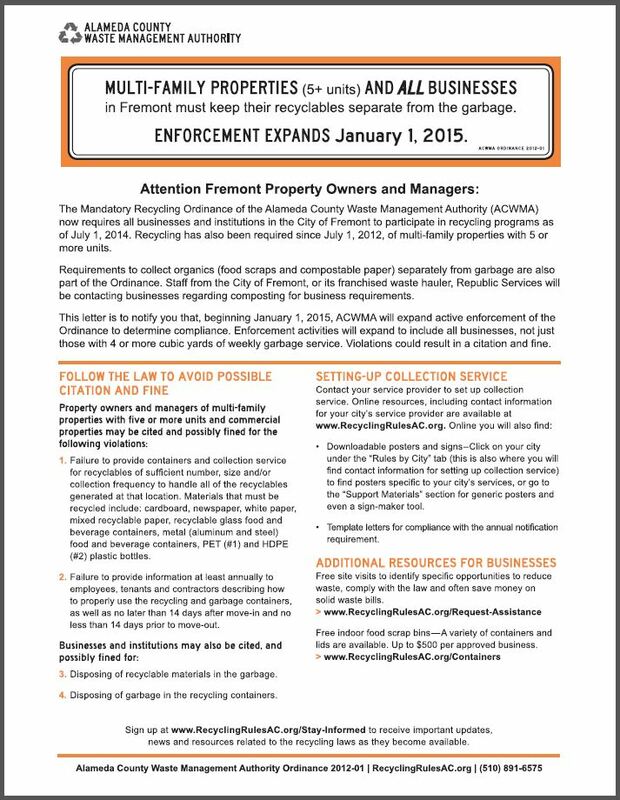 The focus of the insert is to inform property owners and managers of the resources available to help them comply with the Ordinance. Flyers/bill inserts promoting the Free Indoor Food Scraps Bin Program where businesses can get up to $500 worth of equipment from one of three partner vendors. Printed copies for display counters and events, as well as the artwork source files in InDesign for bill insert customization or printing are available upon request. Printed versions of these postcard handouts are available upon request to Alameda County jurisdiction or hauler representatives. 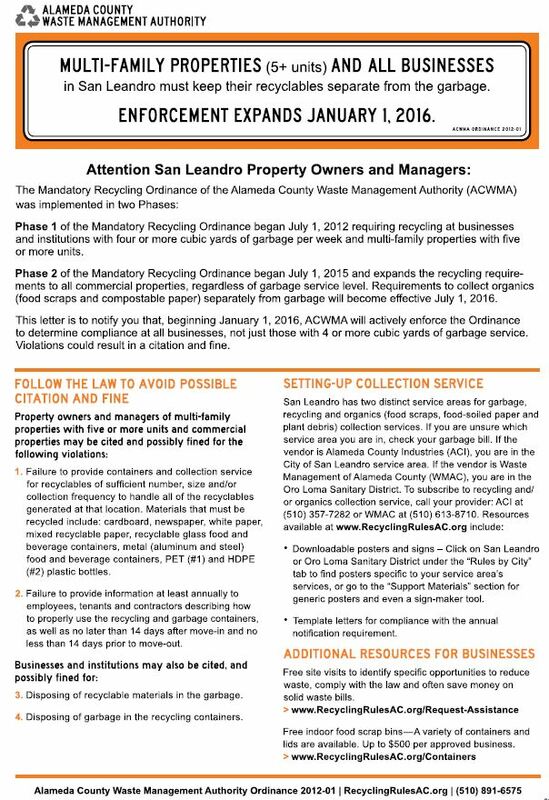 Printed versions of these handouts are available upon request to Alameda County disposal sites or hauler representatives. 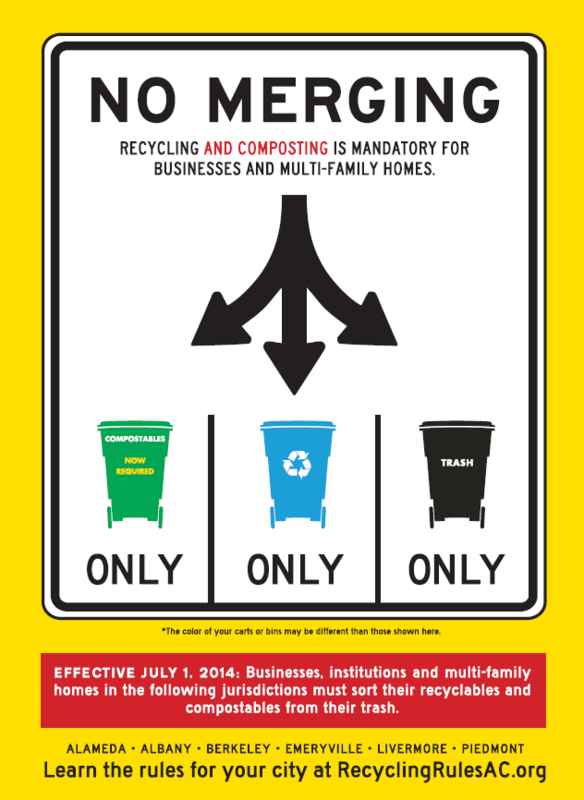 The Mandatory Recycling Ordinance is enforced through a combination of routine inspections and administrative review of service data provided by waste haulers. 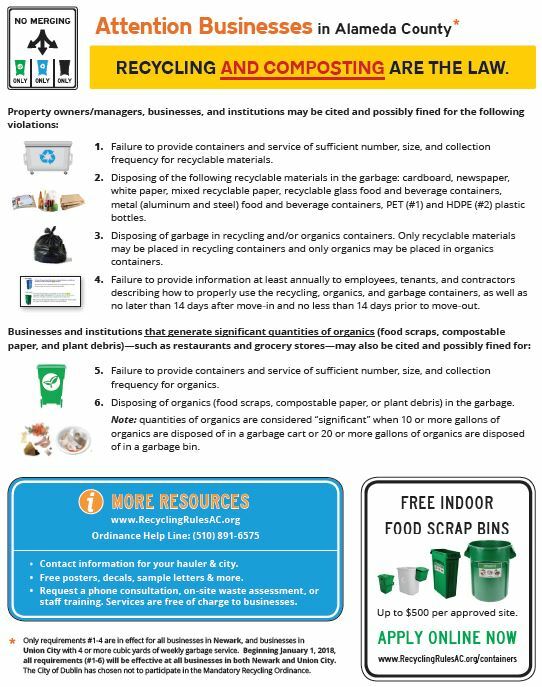 On a rotating basis, inspectors are dispatched to business properties to inspect the garbage, recyclables and, if required, the organics collection containers. If upon inspection or review of records, one or more Ordinance violations are found, a letter will be mailed to the service address of the property owner or manager. If the billing address is different, a second letter will also be sent to the billing address. A series of enforcement letters are sent prior to a fine being issued. The sample letters below are provided as reference. To identify a specific letter version being referenced by a customer, ask for the letter title and version noted in the footer of the enforcement letter. If a property is inspected, a violation is found, and the site has not yet received an Administrative Official Notification letter, the above “Official Notification (inspection-based)” letter is used to notify the business or multi-family property of the Ordinance requirements and their violation(s). Once a property has received an Official Notification letter (Administrative Notification or inspection-based Official Notification), they are considered to be officially notified of the Ordinance requirements. If a violation is found upon inspection or upon review of hauler records, the Notice of Violation letter is used. This letter informs the business or multi-family property of the violation observed, what must be done to correct the violation(s), and warns the property of the possible consequences if the violation(s) are not corrected, before being subject to an Administrative Citation and fine. This letter includes two tables: one to indicate which violation(s) were witnessed (first page), and one to indicate the specific actions required to correct the violation(s) and the potential fine(s) if not corrected (second page) within the specified time period. Citations and fines will be issued if there is continued non-compliance after Official Notification and Notice of Violation letters are sent. In the event a citation is issued, the letter above is used. The table on page 1 details the observed violations and fines. The table on page 2 explains the specific actions required to correct the violation(s) to avoid a subsequent citation and fine. The total fine amount must be paid within 30 days according to payment instructions detailed in the letter, or the citation may be appealed. 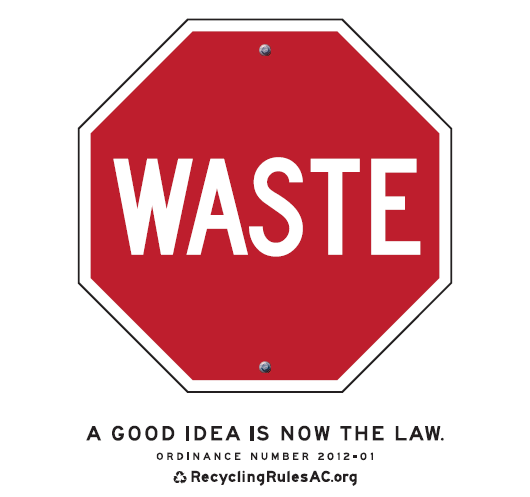 Three Phase 1 mailings were sent from ACWMA to affected properties (starting in 2012) to notify them of the Mandatory Recycling Ordinance requirements prior to the start of enforcement. Three Phase 2 mailings were sent from ACWMA to accounts that had new requirements or would be newly covered as of July 1, 2014. As additional jurisdictions come into Phase 2, similar mailings are sent in advance of their effective and enforcement action dates. Mailings were sent to service addresses and billing addresses (if different). Note for Phase 1 Direct Mail #1: Page 1 of the PDF shows the back of the mailer 11 x 17″ mailer which was folded to a final 8.5 x 11″ size. The following pages show the inside of the mailer which were customized for each jurisdiction. Mailed in July 2012 for most covered jurisdictions and in March 2013 for Pleasanton, with one version for multi-family properties and one version for businesses/commercial accounts. Mailed in December 2012 for most covered jurisdictions and in August 2013 for Pleasanton, with one version for multi-family properties and one version for businesses/commercial accounts. Mailed in May 2014 to accounts with new requirements or newly covered accounts as of July 1, 2014, with two versions depending on Phase 2 opt-in status. Full opt-in jurisdictions included Alameda, Albany, Berkeley, Emeryville, Livermore, Piedmont and unincorporated areas of Alameda County (not covered by the Castro Valley or Oro Loma Sanitary Districts). Partial opt-in jurisdictions included Castro Valley, Fremont and Oakland. Mailed in July 2014 to all covered accounts, including newly covered accounts as of July 1, 2014. It was also mailed to covered accounts in jurisdictions that had opted-out or postponed implementation of Phase 2. Different versions were done for each jurisdiction. Mailed in December 2014 to accounts with new requirements or newly covered accounts as of July 1, 2014, with four versions depending on Phase 2 opt-in status. Mailed in May/June 2015 to newly covered below 4 cubic yard of weekly garbage accounts in Newark and San Leandro and all businesses and multi-family accounts with new organics requirements as of July 1, 2015, in the City of Hayward and Oro Loma Sanitary District’s L2 service area. 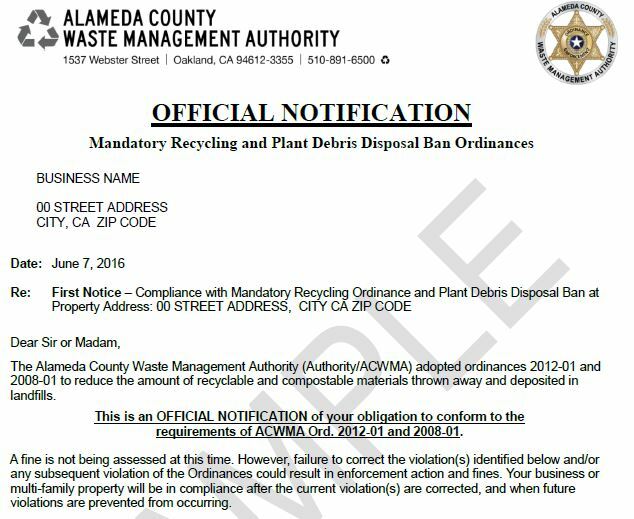 Mailed in July 2015 to newly covered below 4 cubic yard of weekly garbage accounts in Newark and San Leandro and all businesses and multi-family accounts with new organics requirements as of July 1, 2015, in the City of Hayward and Oro Loma Sanitary District’s L2 service area. 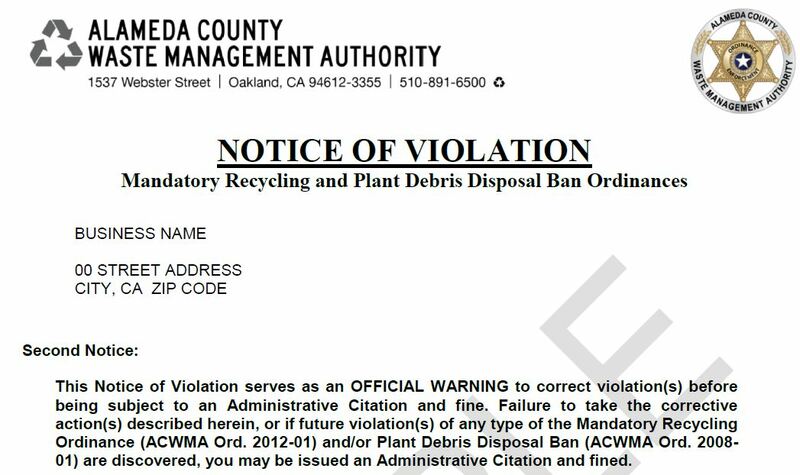 Mailed in mid-December 2015 to newly covered below 4 cubic yard of weekly garbage accounts in Newark and San Leandro and multi-family accounts with new organics requirements as of July 1, 2015, in the City of Hayward and Oro Loma Sanitary District’s L2 service area to remind them that enforcement begins on January 1, 2016. 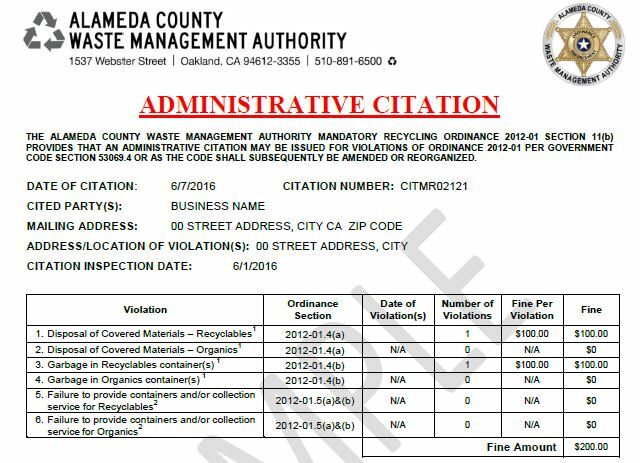 The Hayward and Oro Loma Sanitary District L2 service area commercial accounts with 4 or more cubic yards of weekly garbage service were mailed the business version in early January 2016. 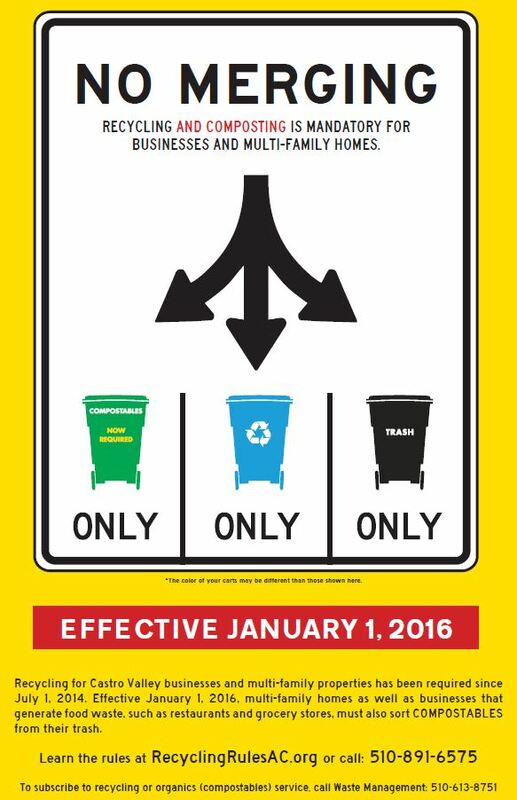 Direct Mail #1 was mailed in November 2015 to businesses and multi-family properties in the Castro Valley Sanitary District (CVSan) service area that will have new organics requirements effective January 1, 2016. Direct Mail #2 was mailed in January 2016. Direct Mail #3 was mailed in early June 2016 reminding accounts that enforcement actions will begin July 1, 2016. 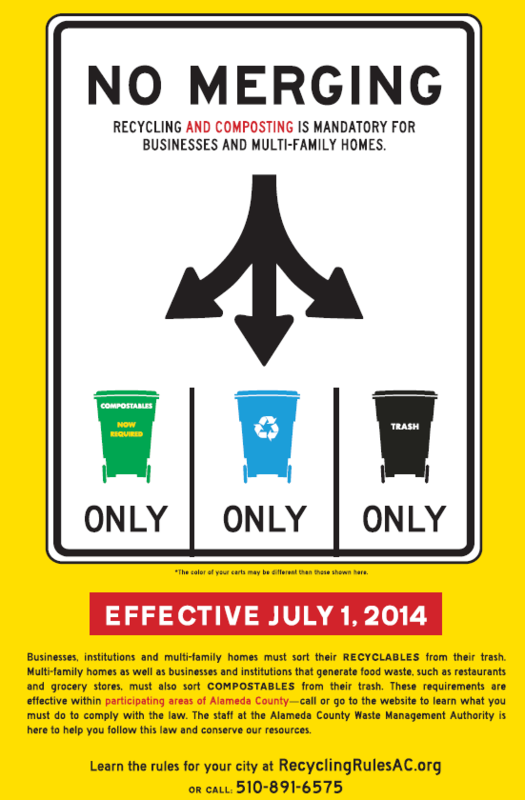 Direct Mail #1 was mailed in May 2016 to businesses and multi-family properties in Oakland and San Leandro that will have new organics requirements and businesses with less than 4 cubic yards of weekly garbage service in Hayward that will have new recycling requirements effective July 1, 2016. 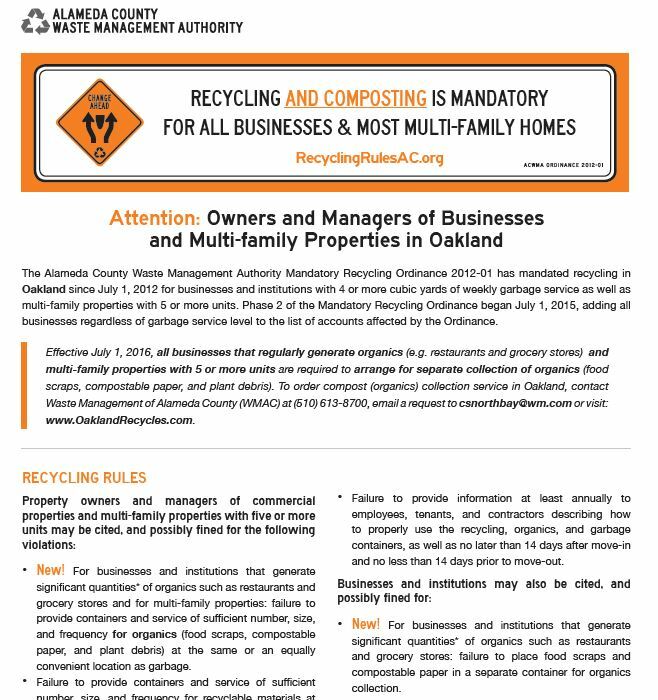 These mailers were sent to businesses and multi-family properties in Oakland and San Leandro that have new organics requirements and businesses with less than 4 cubic yards of weekly garbage service in Hayward that have new recycling requirements effective July 1, 2016. Direct Mail #2 was mailed in July 2016. Direct Mail #3 was mailed in late November 2016 to remind accounts that enforcement actions begin January 1, 2017, for the new requirements. 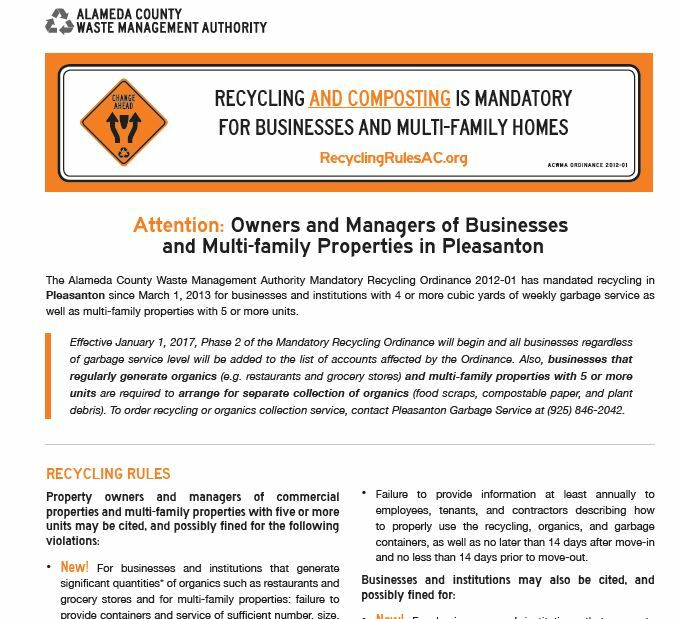 Direct Mail #1 was mailed in mid-November 2016 to businesses and multi-family properties in Pleasanton and Oro Loma Sanitary District’s L1 service area that will have new recycling and/or organics requirements effective January 1, 2017. Direct Mail #2 was mailed in early January 2017. Direct Mail #3 was mailed in early June 2017. 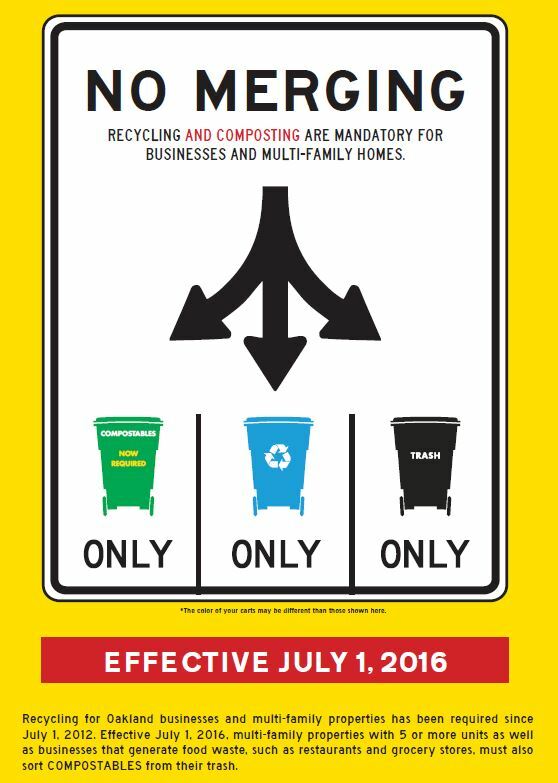 Direct Mail #1 was mailed in late May 2017 to businesses and multi-family properties in Fremont that will have new organics requirements effective July 1, 2017. Direct Mail #2 was mailed in late July 2017. Direct Mail #3 was mailed in early December 2017. 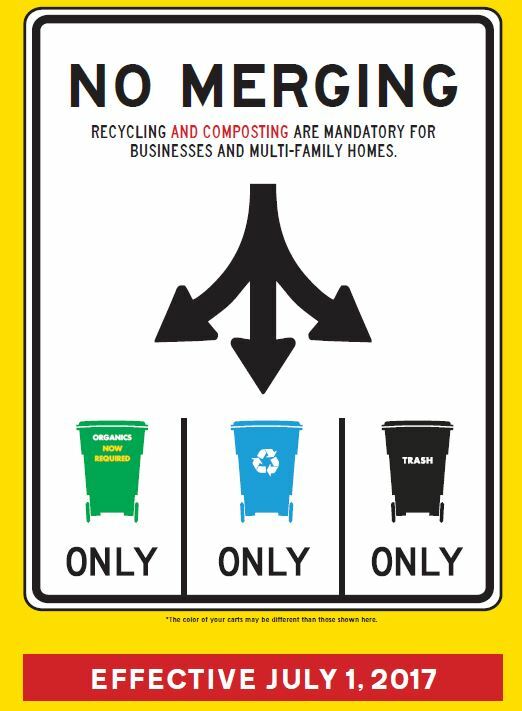 Direct Mail #1 to Union City businesses and multi-family properties will be mailed in early December 2017 that will have new recycling and organics requirements effective January 1, 2018. Direct Mail #1 to Newark businesses and multi-family properties was mailed in mid-December 2017 that have new organics requirements effective January 1, 2018. Direct Mail #2 was mailed in mid-January 2018 and Direct Mail #3 will be mailed in mid-May 2018. 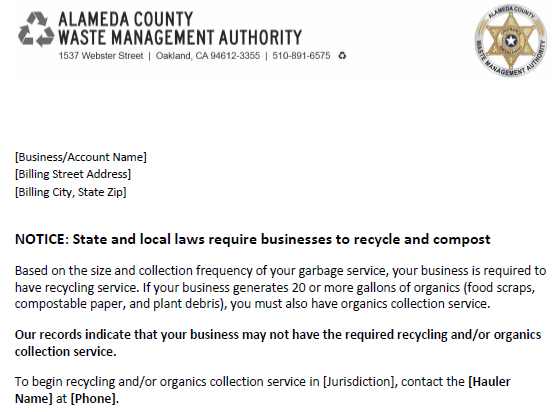 In December 2018, a letter was mailed out to selected businesses that are covered by state laws AB 341 and AB 1826 and may be out of compliance with the recycling and organics collection service requirements. 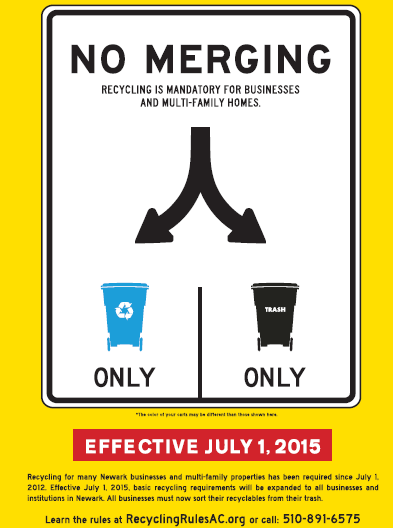 Per the jurisdiction’s request, these were sent out in the Cities of Alameda, Albany, Berkeley, Emeryville, Livermore, Pleasanton, San Leandro and Union City to commercial accounts that had not received a Mandatory Recycling Ordinance enforcement letter or technical assistance contact in calendar year 2018.